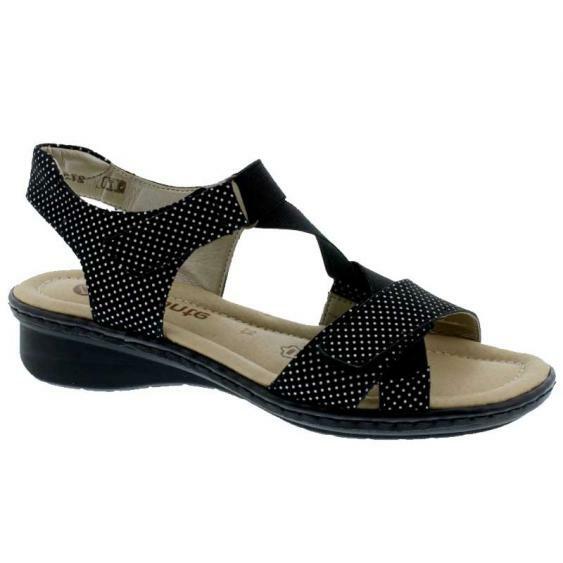 European style and comfort that won't quit, the Remonte Dorndorf by Rieker D2757 sandals will make your feet thank you. These women's open-toe sandals feature a strappy elastic and leather upper with multicolored straps for a fun look. A hook-and-loop strap makes for easy on/off and an adjustable and flexible fit. The cushioned footbed is leather covered to help wick away moisture while delivering all day cushion and support. The polyurethane outsole is very flexible to give you that extra spring in your step. Artisan style and European comfort combine for a warm weather sandal you'll wear over and over again, the Remonte Dorndorf by Rieker D2757.